It is getting close to the time of year that many horse and pony owners dread! Spring isn’t all about lighter evenings, rug-less equines and show dates for many people, it brings a whole new set of management problems caused by warm, damp weather and lush new grass! For those four-legged friends prone to laminitis, spring can be a worrying time! When the poached, brown fields turn from thick mud to lush green grass it can be tempting to fling our horses out into the pasture! While this may create initial squeals and bucks of pleasure, for some equines it can soon turn painful. What makes spring grass potentially harmful? During the springtime, with a combination of damp conditions, warmer weather and sunshine, grass grows rapidly. During daylight hours with plenty of sunshine grass produces and stores a lot of sugar (often referred to as “non-structural carbohydrate”). During the hours of darkness, when no photosynthesis is possible, the grass uses this sugar reserve as an energy source. This is why sugar levels in grass vary from day to day (less sugar is produced when it is dull or wet) and over the course of the day too. For some horses this may not pose a problem to their metabolism, however for those prone to weight gain and laminitis this excess sugar can increase the risk of laminitis. 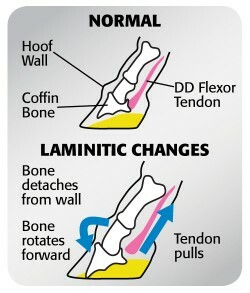 In short, laminitis is inflammation of the laminae tissues, which produces pain and lameness and can cause tears of the internal bond between the dermal and epidermal laminae. However there are many processes that occur within the foot and in severe cases these changes can cause a rotation or drop of the pedal bone. For this reason it is important to monitor horses carefully for any health concerns, particularly during the springtime. Introduce your horse gradually to new pasture. During the winter your horse should be consuming a diet consisting of mostly hay or haylage as a forage source. Fresh spring grass has a much higher feed value and a much lower fibre content than hay of haylage, so transition your equine slowly to any change of diet over a period of several weeks. Limit the time your horse spends out at grass; if this is not an option consider the use of a grazing muzzle. Consider using strip grazing. Not only will this enable you to monitor the amount of grass your horse is on, but it also encourages them to move and exercise more. Choose the time you turn your horse out carefully. Studies have found that the risk of laminitis can be increased in pasture that has been exposed to cold nights and sunny weather, particularly after a frost. The level of fructans in the grass will be higher first thing in the morning so consider turning your horse out overnight. Maintain a regular exercise regime to ensure that calories in are balanced with calories out. If time is of the essence then consider a short lunge or free school to get your horse moving. Remember to adjust any hard feed rations in accordance to spring grazing. You may also need to consider the quality of hay or haylage you are providing when not at grass. Soaking hay can reduce the nutrient content to provide regular fibre intake but with less calories, equally a good quality straw can provide fibre to support the equine’s innate need to trickle feed. 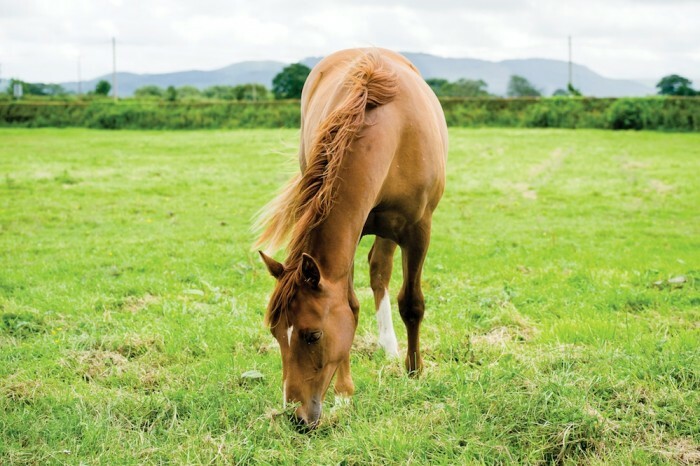 Don’t be tempted to starve the laminitis prone equine, not only could this affect his digestive system, but a hungry horse or pony is more likely to gorge as soon as he has access to food. Even the laminitis prone equine requires a balance of vitamins and minerals. Horslyx offers an ideal method of controlling calorie intake in horses and ponies prone to laminitis without compromising on valuable vitamins and minerals. The carefully chosen ingredients offer a balanced and palatable method of feeding the required nutrients to help support hooves, coat and skin and general wellbeing. 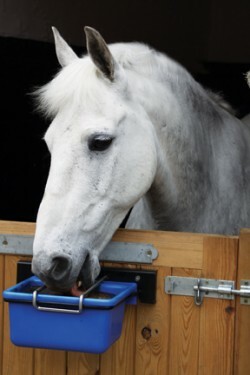 The rate of consumption of food is the key to safe feeding for overweight equines and those prone to laminitis, and Horslyx is perfect as licking takes time and patience. Allowing a horse restricted access to Horslyx will give your customer peace of mind that they are still receiving a balanced diet without the risk of adding extra calories through concentrate feed. Restriction can be by using the 5kg Holder with Restrictor Bar or by physically removing the lick.